A 175-year history of innovation. For 175 years we have been driving innovation in ventilation and air-handling technology with our range of high-grade products. Many pioneering developments have enabled us to provide customers and end users with forward-looking solutions time and again. Today we are the world leader in technology-driven industrial fans and maintain a corporate culture of mutual respect with trust, openness and joy of achievement, because inside and outside this culture is for us a matter of personal importance. We understand the needs of our customers and work in partnership in order to develop innovative solutions. 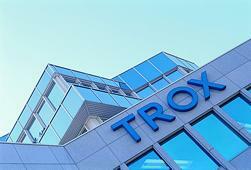 Through effective networking within the TROX organisation, we use the global strength of TROX and expand our capabilities in the interest of our customers. Fans move air and other gases, conveying them from one place to another. This air-handling capability is essential in process technology, thermal engineering, de-dusting systems and building services, tunnel ventilation and wind tunnel equipment. TROX-TLT GmbH's fans and systems give optimum performance in a host of application environments including fire protection, chemical and petrochemical processes, cementmaking, electronics, foodstuff processing, precision mechanics, automotive engineering, shipbuilding, mine ventilation, power stations, air-conditioning and ventilation systems, mechanical engineering, waste incineration, pharmaceutical production, steelmaking, underground car parks, dryers, tunnel venting and wind tunnel construction. Put our expertise to the test with your next project. You will find your contact partners here. FOR TROX, PEOPLE ALWAYS COME FIRST.